Yes, you read that title right, this wedding was very much a secret. Only the bride and groom, two witnesses and myself knew about it. Joanne and Phil had decided to keep it all a secret and tell both of their families what they’d done after they came back from honeymoon. This is the full story of my smallest wedding yet. I have photographed quite a few small intimate weddings but my previous record was 5 people including the bride and groom. I met up with Joanne and Phil on a dreary, damp Thursday morning in Manchester. 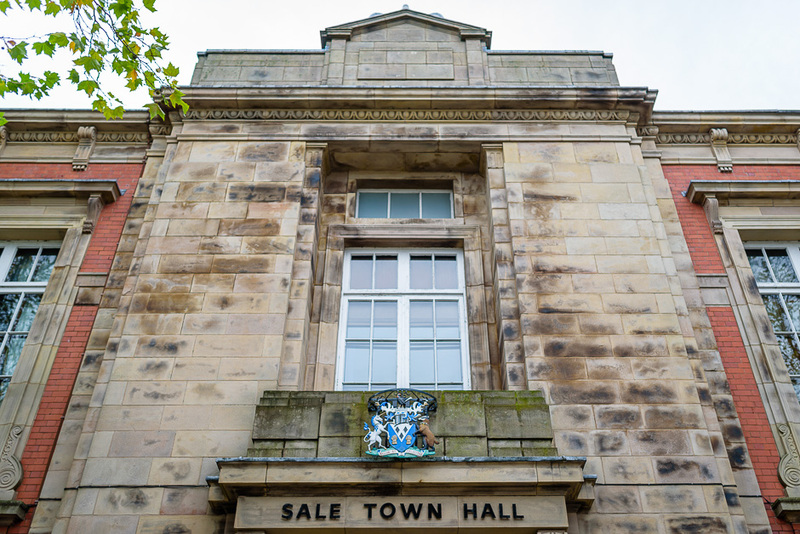 They’d chosen Sale Town Hall as their ceremony venue and opted to use the small intimate room for the ceremony as the main room at Sale Town Hall would have been too big. Joanne & Phil didn’t go for the superstition of not seeing each other before the start of the ceremony and arrived together. Joanne had one huge surprise for Phil though and as he was waiting for Joanne to enter the room, the music started, ABBA’s Dancing Queen no less and both the girls came in strutting their stuff like it was 1979 all over again! A gorgeous little ceremony then took place and after all the necessary details were finalised, all four then left the room to more music. I don’t think the registrars had seen anything like it before. 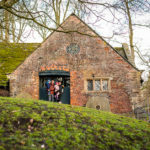 We came out of Sale Town Hall for a few photos and our plan was to head to the canal side. Unfortunately it was still raining out there and I thought Joanne wouldn’t want to go. I was wrong and off we walked to the canal bank for the bride and groom shots. Luckily, there’s a bridge where the road goes over the canal and that gave us a little shelter from the elements. After these shots were completed we then went to the King’s Ransom on the other side of the canal. It was time for drinks and a toast before all four headed to Manchester to catch the plane to Barcelona for a few days. I’m still not sure what happened when they returned and broke the news to their family but I’m sure it was fine. As I drove my car home I still had a huge smile on my face. This couple made that happen. I can’t ask for more from this job, what a job it is. Thank you Joanne & Phil. 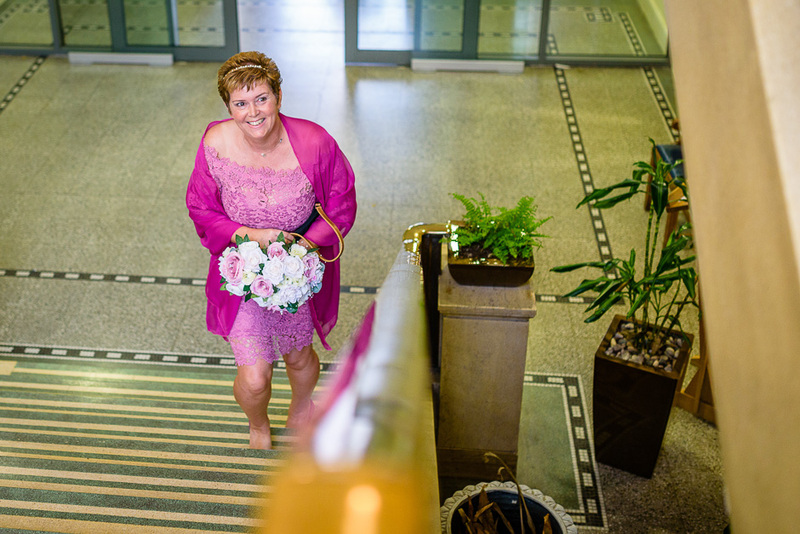 Sale Town Hall is a beautiful venue for any wedding in Trafford. There is a choice of two ceremony rooms. The Mayor’s Parlour for up to 16 guests and the Marriage Room will hold up to 50 guests. The Town Hall is part of the Sale Waterside development and stands on the Bridgewater Canal in the centre of Sale. There are lots of bars and restaurants in the area around Sale Waterside and the Town Hall and Waterside Plaza provide good locations for wedding photos. 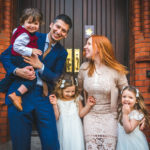 If you are looking for an Elopement Wedding Photographer in Manchester or any other area in the North West then please check out my wedding prices page and then get in touch to check availability.